Just as professional chefs do with the finest high quality cookware, Red Copper pans need to be seasoned before you use it for the first time. Seasoning is simple. Spread a light coating of vegetable oil over the entire inside surface of the pan. Place pan in an oven that is preheated to 300 °F for 20 minutes. Carefully remove the pan from the oven using oven mitts. Let the pan cool down completely. Wipe away excess oil with a cloth or paper towel. To maintain the exceptional performance, we recommend that you repeat this process at least twice a year*. We also recommend before first use that you hand wash the pan in hot water with a mild soap or dish detergent. Rinse thoroughly and dry with a soft dish towel. * If the performance of the non-stick coating diminishes repeat the seasoning process. 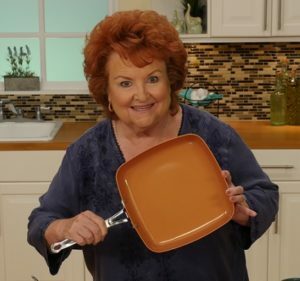 Red Copper’s non-stick surface does not require the addition of oil or butter during cooking. For taste you may want to add a small amount of oil/butter that has a high smoke point. Do not use extra virgin olive oil or aerosol cooking sprays. They cannot withstand high heating and will leave a thin carbonized layer on the non-stick surface of your pan. We recommend that you use this pan on low to medium heat for most cooking. 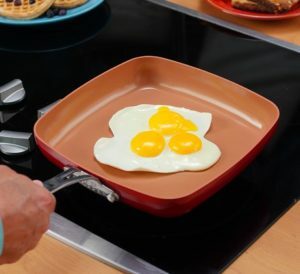 The Red Copper non-stick coating distributes the heat more effectively and evenly.